The Payroll Change Log is an enhancement to People Inc. designed to collect together all of the changes that relate to payroll processing. The Payroll Change Log is updated automatically when users make changes to employee details elsewhere in the system. The changes could be made by an HR user, or by the employee themselves (via the Employee Self Service module). Details of any changes can be viewed in a list within the People Inc. system. The payroll team can be granted access to People Inc. (via their own access profile if necessary) so that they can view the log of changes themselves. Each record contains the information required to process the change, but further details related to a change can be viewed by clicking on a link in the record. The information in the Payroll Change log can be extracted (in MS Excel spreadsheet format) and passed to payroll for processing. This information can of course be filtered or sorted so that is only shows events from a particular payroll month, or events associated with a particular type of employee (perhaps full time staff or permanent staff) for example. Standard reports are provided with the payroll change log screen. These include reports to detail: New Starters in period; Leavers in period (including holiday remaining); Changes to Jobs; Changes to Salaries; Payroll Period summary. 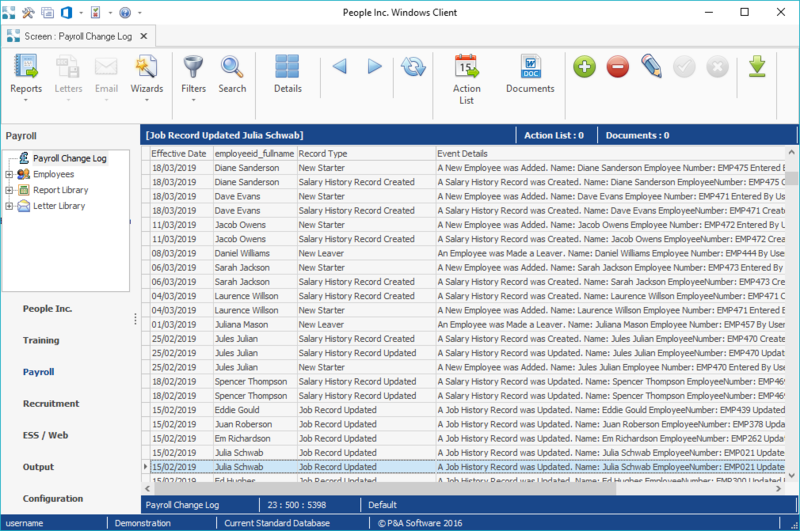 Adding the functionality to your People Inc. system will only take a few moments/ If you would like to find out more, contact your account manager or the People Inc. helpdesk to discuss this.